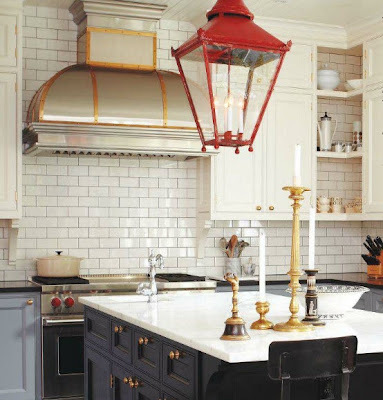 This delicious kitchen designed by Tommy Smythe, co-host of Sarah's house is very much like a perfect dessert where the red vintage lantern plays the role of a cherry on the cake. Tommy revamped a classic Victorian home in what he calls the new "Victorian look" and I can see why. Painting the molding kitchen cabinets with three very traditional colors, paneling the ceiling and using red throughout is a genius way to modernize the Victorian style. 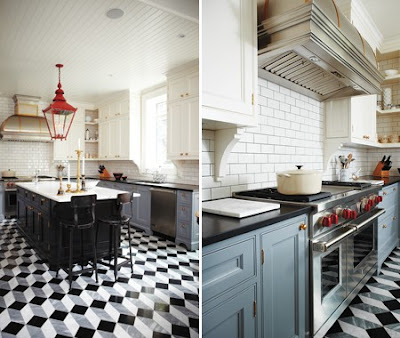 The beautiful floor is painted in a Roman style geometric pattern. That custom made range hood, how handsome with that gleaming brass accent! This kitchen has all the thoughtful details, from the gray grouts that gives it an older feel to the brackets under the cabinets that add more ornamentation to the style. A kitchen with a sitting area like this is not an average one. I love how Tommy used black wood instead of an old-looking and Victorian era mahogany color. The chair and tufted red sofa make a nod to Victorian style as well, but in a very updated way. The floor to ceiling tiles add another beautiful layer. Images via House and Home. You have read this article black and white geometric floor / brass and steel range hood / brass cabinet hardware / floor to ceiling tiles / kitchen / red lanter / roman pattern floor / Tommy Smythe with the title Kitchen of the week: Tommy Smythe's kitchen. You can bookmark this page URL http://ourpicturewindow.blogspot.com/2012/02/kitchen-of-week-tommy-smythe-kitchen.html. Thanks! 1 comment for "Kitchen of the week: Tommy Smythe's kitchen"
I have read several articles in industrial kitchen equipment and accessories, but this article seems to be pretty much confident with unique and interesting lines. Personally, I think it’s greatly a necessary article which is amazing with its technique to understand.